We here at PowerProduction often talk about how invaluable pre-production is to the filmmaking process, and how helpful our customers have found our storyboarding software. But we don’t always emphasize how students find our software applicable to different academic subjects. 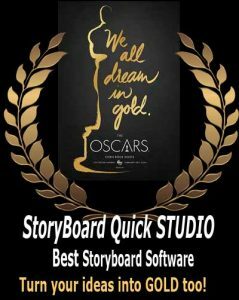 As a college student and intern at PowerProduction, I’ve found StoryBoard Quick and StoryBoard Artist to be a great tool for my projects in any class that requires planning or creativity. I’ve used StoryBoard Quick for easy, simple sketches of page layouts in my Document Editing class, and StoryBoard Artist for fully-functional, in-depth renderings of my design projects. I’ve also consistently succeeded in giving my creative writing new depth with the aid of StoryBoard Quick. I had never considered using visuals for planning writing before I was hired at PowerProduction, but hearing the testimonies of scriptwriters made me want to try it out! Now whenever I experience writer’s block on a story that is due in my Creative Writing class, I just pull up Quick and sketch out what has happened recently in my plot. The graphics in the program, plus all my Add-On Libraries, often help me recreate what I’ve envisioned and jump start my imagination for what can develop next. Once I’ve got a new direction for my writing, I can quickly create boards that represent my plan so I can delve back into writing and keep on track with my plot. It’s so much easier to create, imagine, and plan with StoryBoard Quick and Artist. These programs are so flexible, and they’re applicable to a wide range of academic disciplines. Students from elementary school up through college level have used storyboarding for non-film classes, and some school districts and universities provide their students with media labs equipped with Quick or Artist. Don’t underestimate the Power of visual development and what it can do for you and your Productions.